"Beautiful" is a song recorded by American singer Christina Aguilera for her fourth studio album, Stripped (2002). It was released as the album's second single on November 16, 2002. A pop ballad, "Beautiful" was written and produced by Linda Perry. Lyrically, it discusses inner beauty, as well as self-esteem and insecurity issues. Aguilera commented that she put "her heart and her soul" into the track, which she felt represented the theme of Stripped. The song was later re-recorded in an electronic style for her first greatest hits album Keeps Gettin' Better: A Decade of Hits (2008). Upon its release, "Beautiful" received universal acclaim from music critics, who have ranked it among Aguilera's strongest material. It won a Grammy Award for Best Female Pop Vocal Performance and was also nominated for Song of the Year at the 2004 ceremony. "Beautiful" was also a commercial success, topping the charts in Australia, Belgium, Canada, Ireland, New Zealand and the United Kingdom. The song peaked at number two on the Billboard Hot 100 in the United States, where it was certified Gold for 500,000 units shipped. It was kept from the number one spot by "Bump, Bump, Bump" by B2K featuring P. Diddy. "Beautiful" has been widely embraced as an anthem by the LGBT community for its message of self-empowerment and inner beauty. An accompanying music video was directed by Jonas Åkerlund, and earned Aguilera a GLAAD Media Award for its positive portrayal of gay and transgender people. In 2011, UK LGBT rights organization Stonewall named "Beautiful" the most empowering song of the previous decade for gay, lesbian, and bisexual people. In 2009, Rolling Stone and VH1 listed it as one of the best songs of the 2000s (decade). The song is widely recognized as one of Aguilera's signature songs and has been covered on numerous occasions and featured on several television shows. A 23-second sample of "Beautiful", a piano-driven ballad which features bass guitar, cello, drums, keyboards, piano, and violin in its composition. "Beautiful" was written and produced by Linda Perry. Aguilera recorded the song at two studios: The Enterprise Studios in Burbank, California, and Conway Recording Studios in Hollywood. Prior to the collaboration with Aguilera, Perry had written the song and originally wished to keep the "personal" record for her own singing career. Perry initially previewed the song for Pink during the recording sessions of Pink's second studio album Missundaztood (2001), on which Perry is a producer. However, after hearing Aguilera sing the song at Perry's house to "break the ice", Perry was very impressed and allowed Aguilera to include the track on her then upcoming record Stripped, effectively deciding not to pursue a solo career. The choice resulted in a feud between Pink against Aguilera and Perry, with the former commenting that it was "annoying" for the latter to collaborate with artists "[she] didn't like". Perry later revealed to ASCAP, "When Christina came over to my house to start working, she asked me to play some songs to break the ice. [...] I had a long conversation with my manager about it. We both decided to hear Christina sing it. We demoed the song with her singing it, and I was like, 'Wow'. That rough vocal is what is out there on radio. It was that vocal that got her the song". Perry's wife Sara Gilbert confirmed on her show The Talk that the final version was "just a demo" and Aguilera wanted to rerecord the song which Perry denied the request because the song is supposed to be about imperfection and being vulnerable. "Beautiful" is a gentle pop ballad that discusses issues of self-esteem and insecurity, promoting a message of self-empowerment and embracing inner beauty. Larry Flick of Billboard added that the song talks about "overcoming life's trials", Chuck Taylor also of Billboard observed that it has a message of "holding oneself up against criticism from the outside," and Todd Burns of Stylus noted that the song "also explores the main theme of the record, being stripped bare in front of the public." Its instrumentation incorporates bass guitar, cello, drum kits, keyboards, piano, and violin. "Beautiful" was composed in the key of E♭ major and moving at a slow 76 beats per minute. Aguilera's vocal range spans over two octaves from E♭3 to G5; she uses several melismas in the song, fitting as many as seven notes in one syllable. "Beautiful" was released as the second single from Stripped. It was first sent to American contemporary hit and rhythmic radio stations on November 16, 2002. The song was later released as a CD single on January 27, February 24, and February 25, 2003, in Germany, the United Kingdom, and France, respectively. Also on February 25, a digital remix EP of "Beautiful" was released worldwide. Two days later, the single was released as a maxi single in Canada. On March 11, 2003, the single was released as a CD in the United States. Aguilera performing "Beautiful" on her Back to Basics Tour. Upon its release, "Beautiful" received universal acclaim from music critics. Stephen Thomas Erlewine of AllMusic complimented the song for not following the "club and street-level R&B, which fit her poorly". Similarly, a reviewer from Billboard recognized "Beautiful" as a "single-worthy ballad" from a record of "pleasantly surprising depth". In a separate review, Chuck Taylor from the same magazine labeled the song "breathtaking", and recognized its melody and lyrical message. Entertainment Weekly's David Browne called the song one of Stripped's "moments", noting that it is "more restrained" than the other songs from the album. Sal Cinquemani of Slant Magazine commented that the collaboration with Linda Perry found Aguilera "truly naked" and reflective of the album's title. Stylus Magazine's Todd Burns gave Stripped a negative review, but complimented "Beautiful" for "tastefully [reining] in Aguilera's frequent vocal acrobatics". Jane Dark of The Village Voice compared the song to the works of Mariah Carey "made back when she was a natural". In contrast, Amanda Murray from Sputnikmusic criticized the "platitude-drenched" lyrics but praised the overall production. At the 2004 Grammy Awards, "Beautiful" won the award for Best Female Pop Vocal Performance and was nominated for Song of the Year. "Beautiful" is considered to be Aguilera's signature song and has been recognized as being among her strongest tracks. The song was recognized as her third-best single by Rachel McRady of Wetpaint, who commented that "Xtina's inspiration ballad motivated an entire generation". PopCrush's Alexandra Capotorto named it as her favorite track by Aguilera, opining that the song is "definitely one of the most memorable and greatest Christina Aguilera songs to date". Rolling Stone ranked "Beautiful" at number 52 on their list of the 100 best songs of the 2000s (decade), elaborating that it is "delivered with full-fathom force by the bottle-blond with the biggest voice". Similarly, VH1 positioned the track at number 18 on their list of the 100 greatest songs of the past decade. "Beautiful" was quickly released after the underperformance of the album's first single, "Dirrty". It achieved international success and was the highest-charting single from Stripped in several territories. The song peaked at number 2 on the US Billboard Hot 100 and became Aguilera's longest-charting solo track, spending twenty-seven weeks on the chart. The song additionally topped Billboard Adult Contemporary, Hot Dance Club Songs, and Pop Songs component charts. By March 2006, it was certified gold by the Recording Industry Association of America (RIAA) for shipments of 500,000 copies.. As of August 2014, the single has sold 1,512,000 digital copies in that country. In Canada, the song reached number 1 on the Billboard Canadian Hot 100. "Beautiful" proved similarly successful in Europe, where it peaked within the top five of most markets in which it was released. Spending a total of fifty-one weeks on the UK Singles Chart, the song eventually peaked atop the chart; it was certified silver by the British Phonographic Industry. It peaked at numbers 3 and 18 on the Belgian Ultratop 50 and Ultratop 40, respectively. In Germany, the song peaked at number 9 after charting for thirteen weeks on the Media Control Charts. However, "Beautiful" proved less successful on the French Syndicat National de l'Édition Phonographique, where it reached number 27. In the Pacific regions, the song failed to chart in any Asian markets, but maintained a strong performance in Oceania. It peaked at number 1 on the Australian ARIA Charts, where it spent a total of thirteen weeks. "Beautiful" was later certified platinum by the Australian Recording Industry Association (ARIA) for shipments of 70,000 units. The song also charted on the New Zealand Top 40 Singles Chart for twenty-three weeks, during which period it peaked at number 1. The accompanying music video for "Beautiful" was directed by Jonas Åkerlund and premiered on December 9, 2002. It opens with Aguilera speaking the line "Don't look at me", followed by scenes of her singing alone in a room intercut with self-image-related sequences of other people. An anorexic girl examines herself in a mirror, eventually punching through it; a thin teenage boy stands lifting weights in a room plastered with images of bodybuilders; and an African-American girl rips out pages of women's magazines including photos of only white women and throws them into a fire. In one sequence, a girl is physically bullied by several peers, and in another, a goth man sits at the back of a bus while several people get up and move. The video also touches on LGBT issues; one scene features a gay couple, portrayed by Jordan Shannon and Justin Croft, kissing on a bench and ignoring the stares of people who pass them. Another shows a transgender person, played by Robert Sherman, putting on makeup, a wig, and women's clothing. The music video debuted at number 2 on Total Request Live, spending a total of fifty days on the chart and retiring at number 6. It topped MuchMusic's Countdown for two consecutive weeks and remained on the countdown for fifteen weeks. The video received a Special Recognition award, presented by David LaChapelle, from the Gay & Lesbian Alliance Against Defamation at its 14th GLAAD Media Awards. After an a cappella performance of the song, Aguilera stated in her acceptance speech that "this song is definitely a universal message that everybody can relate to – anyone that's been discriminated against or unaccepted, unappreciated or disrespected just because of who you are." Recognized as one of her signature songs, Aguilera has performed "Beautiful" at a number of venues and events. During the promotion of Stripped, she appeared on VH1's Big In Awards, Top of the Pops, and the 46th Grammy Awards. The song was included on the setlists of The Stripped Tour, the Justified and Stripped Tour in 2003 and the Back to Basics Tour in 2006. "Beautiful" was also sung on the television special VH1 Storytellers in 2010. "Beautiful" has also been performed on charity events and fundraisings, such as CNN Heroes introduced by Anderson Cooper saying, "It's my pleasure to introduce a performer with unparalleled range and passion; her song is a reminder that out of great trials and tribulations we can all create something beautiful"; Justin Timberlake & Friends in 2010, and Hurricane Sandy: Coming Together in 2012. 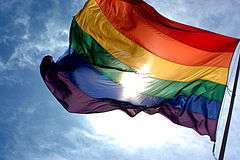 "Beautiful" is widely regarded as an anthem by the LGBT community. "Beautiful" has been embraced by the LGBT community as an anthem. On October 5, 2010, several hundred people gathered in front of the Massachusetts State House and sang "Beautiful" as a tribute to the teenagers who had committed suicide due to anti-gay bullying during the previous months. In March 2011, the Columbus Children's Choir and Columbus Gay Men's Chorus joined to perform the song as a contribution to the It Gets Better Project. UK LGBT rights charity Stonewall named "Beautiful" the most empowering song of the decade for lesbian, gay and bisexual people; media personality and Stonewall contributor Paul Gambaccini called the song "a major achievement that has inspired millions of young people around the world." The result is based on the choice from 1,007 readers. Aguilera commented of the song's reception, "I cannot express in words how much the LGBT community means to me. On my darkest day their support lifts me up. I feel honored that some of my songs become anthems to them as well." Elvis Costello recorded "Beautiful" for an episode of American TV series House. Since its release, "Beautiful" has been covered by many performers. In 2003, indie rock band Clem Snide released the song as part of their A Beautiful EP recording. Kidz Bop covered the original version for Kidz Bop 4 in 2003, and later recorded a dance edit three years later for Kidz Bop 6. Kenny G and Chaka Khan performed the song for the former's 2003 project At Last...The Duets Album. In 2004, it appears on the French girl band L5's live album Le Live, recorded during their concert tour in 2003. In 2012 David Archuleta included his rendition on his fifth studio album Begin. Other performers that have recorded their own versions of the song are G4 in 2005, Girl Authority in 2006, The Lemonheads in 2009, Zebrahead in 2009, The Rebeatles Project in 2010, Insane Clown Posse in 2012, Me First and the Gimme Gimmes in 2014, and Jordan Smith in 2016. Many performers have also played "Beautiful" live on shows and concerts. British rock band The Zutons performed the song on their BBC Radio 1 Live Launch show, on May 28, 2008; this version of the song was later released as part of the compilation album Radio 1's Live Lounge – Volume 3. In 2011, child singer Savannah Robinson performed the song on The Ellen DeGeneres Show, and in 2012 American singer Kelly Clarkson sang "Beautiful" during her Stronger Tour, by audience request. Other notable performers that have covered the song are Gloria Gaynor, Jason Mraz, Brett Anderson, and The All-American Rejects. The song has also been performed by contestants on televised talent competitions. In 2003, Alex Parks, the eventual winner of the first season of Fame Academy, covered the song on the series and re-recorded a version for her debut studio album Introduction. In 2007, Angy Fernández sang "Beautiful" during the inaugural season of Factor X in Spain. In 2010, Sally Chatfield chose the song during the second season of the Australian version of The X Factor. The following year, Aguilera performed the song alongside her finalist Beverly McClellan on the first season finale of The Voice. The following week, it debuted at number 74 on the US Billboard Hot 100 and peaked at number 52 on the Hot Digital Songs diagram with first-week sales of 42,000 downloads on the iTunes Store. Later in 2011, both Janet Devlin and Little Mix covered the song during the eighth series of The X Factor in the United Kingdom. Additionally, cover versions of the song have been featured on scripted television series such as A.N.T. Farm, Glee, House, Smash, and Orange Is the New Black. Credits adapted from "Beautiful" CD single liner notes. ↑ Neuman, Melinda; Mitchell, Cail; Morris, Chris (February 21, 2004). "Billboard Goes To The Grammys: Heard Backstage". Billboard. Prometheus Global Media. 116 (8): 69. Retrieved September 15, 2013. ↑ "Keeps Gettin' Better: A Decade of Hits by Christina Aguilera". iTunes Store (US). Apple. October 6, 2009. Retrieved April 26, 2013. ↑ Mark Richardson (January 15, 2010). "Resonant Frequency: Not Magic Yet". Pitchfork Media. Ryan Schreiber. Retrieved April 26, 2013. 1 2 3 4 Moon, Jin (September 1, 2003). "Linda Perry, High Priestess of Pop". American Society of Composers, Authors and Publishers. Retrieved April 26, 2013. ↑ "Pink's relationship with Linda Perry forever damaged". MSN Music. Microsoft. November 22, 2012. Retrieved April 26, 2013. ↑ The Talk (February 27, 2016). "The Talk - Are You A Perfectionist?". CBS. Retrieved February 29, 2016. 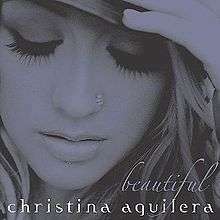 ↑ "Beautiful by Christina Aguilera | Song Stories". Rolling Stone. Archived from the original on March 27, 2014. Retrieved 2014-04-02. 1 2 "Christina Aguilera – Stripped Review". Billboard. Prometheus Global Media. November 2, 2002. Archived from the original on December 20, 2002. Retrieved July 2, 2013. 1 2 Taylor, Chuck. "Reviews & Previews: Spotlights". Billboard. Nielsen Business Media, Inc. 114 (47). ISSN 0006-2510. 1 2 Todd Burns (September 1, 2003). "Christina Aguilera - Stripped - Review". Stylus Magazine. Todd Burns. Retrieved April 26, 2013. ↑ "Christina Aguilera – Beautiful – Music Sheet". MusicNotes. Sony/ATV Music Publishing. Retrieved June 12, 2013. 1 2 "R&R :: Going For Adds :: CHR/Top 40". Going for Adds. Radio & Records. Retrieved April 26, 2013. 1 2 "R&R :: Going For Adds :: Rhythmic". Going for Adds. Radio and Records. Retrieved April 26, 2013. 1 2 3 "Beautiful [Single, Maxi]". Amazon.com (DE). Retrieved April 26, 2013. 1 2 3 "Beautiful [Single, Enhanced]". Amazon.com (UK). February 24, 2003. Retrieved April 26, 2013. 1 2 3 "Beautiful – Maxi CD [CD Single, Single Maxi]". Amazon.com (FR). February 25, 2003. Retrieved April 26, 2013. 1 2 3 "Dance Vault Remixes: Beautiful" (in Dutch). iTunes Store (NL). Apple Inc. Retrieved April 26, 2013. 1 2 "Beautiful [Single, Enhanced, Maxi]". Amazon.com (CA). Retrieved June 11, 2013. 1 2 3 "Beautiful [Single, Enhanced, Import]". Amazon.com (US). Retrieved June 10, 2013. ↑ Stephen Thomas Erlewine. "Stripped - Christina Aguilera". AllMusic. Rovi Corporation. Retrieved April 26, 2013. ↑ David Browne (October 28, 2002). "Stripped Review". Entertainment Weekly. Time Inc. Retrieved April 26, 2013. ↑ Sal Cinquemani (November 2, 2002). "Christina Aguilera: Stripped". Slant Magazine. Todd Burns. Retrieved April 26, 2013. ↑ Jane Dark (November 12, 2002). "Siren Wailing". The Village Voice. Village Voice Media. Retrieved April 26, 2013. ↑ Amanda Murray (July 3, 2006). "Review: Christina Aguilera - Stripped". Sputnikmusic. Jeremy Ferwerda. Retrieved April 26, 2013. ↑ "Complete List of 2004 Grammy Nominations". Music Slam. December 4, 2003. Retrieved April 26, 2013. ↑ Rachel McGrady (March 13, 2013). "Top 5 Best Christina Aguilera Songs of All Time". Wetpaint. Retrieved May 14, 2013. ↑ Alexandra Capotorto. "Top 10 Christina Aguilera Songs". PopCrush. Townsquare Media. Retrieved May 14, 2013. ↑ "100 Best Songs of the 2000s: Christina Aguilera, "Beautiful"". Rolling Stone. Jann Wenner. Retrieved May 14, 2013. ↑ "100 Greatest Songs of the '00s". VH1. Viacom. Archived from the original on May 10, 2013. Retrieved May 14, 2013. ↑ Brian Hiatt (November 1, 2002). "Rump Shaken". Entertainment Weekly. Time Inc. Retrieved April 26, 2013. 1 2 "Beautiful - Christina Aguilera". Billboard. Prometheus Global Media. Retrieved April 26, 2013. ↑ Paul Grein (May 2, 2012). "Week Ending April 29, 2012. Songs: Gotye Makes Digital History". Yahoo! Music. Yahoo!. Retrieved April 26, 2013. 1 2 3 4 "Christina Aguilera - Beautiful". Australian Charts. Hung Medien. Archived from the original on June 6, 2013. Retrieved April 26, 2013. ↑ "Christina Aguilera - Artist - Official Charts". Official Charts Company. Retrieved April 26, 2013. ↑ "ARIA Charts – Accreditations – 2003 Singles". Australian Recording Industry Association. Retrieved April 26, 2013. ↑ "Christina Aguilera - Beautiful". YouTube. October 3, 2009. Retrieved April 26, 2013. ↑ "Christina Aguilera to be Honored at 14th Annual GLAAD Media Awards Presented by Absolut Vodka in Los Angeles". GLAAD. February 28, 2003. Archived from the original on August 18, 2003. Retrieved April 26, 2013. ↑ "Debuts". ATRL. vBulletin Solutions, Inc. Retrieved April 26, 2013. ↑ "Hall of Fame". ATRL. vBulletin Solutions, Inc. Retrieved April 26, 2013. ↑ "Christina Aguilera Beautiful". Top 40 Charts. Retrieved April 26, 2013. 1 2 "Eric McCormack, Todd Haynes, Christina Aguilera, The Hours, Six Feet Under Honored at 14th Annual GLAAD Media Awards Presented by Absolut Vodka in Los Angeles". GLAAD. April 26, 2003. Archived from the original on April 18, 2005. Retrieved April 26, 2013. ↑ Lynn Hirschberg (July 2011). "Christina Aguilera Finds Her Voice". W. Condé Nast Publications. Retrieved April 26, 2013. ↑ "Big in 2002". VH1. Viacom. Retrieved April 26, 2013. ↑ "BBC Online - Top of the Pops - Video Archive". British Broadcasting Corporation. Retrieved May 4, 2013. ↑ Moss, Corey (January 13, 2004). "Timberlake, Aguilera, Outkast Added As Grammy Performers". MTV News. Viacom. Retrieved May 4, 2013. ↑ "Justified and Stripped Tour". Xtina-Web. Retrieved April 26, 2013. ↑ "Back to Basics Tour". Xtina-Web. Retrieved April 26, 2013. ↑ ""Beautiful (VH1 Storytellers)" by Christina Aguilera". VH1. Retrieved April 26, 2013. ↑ "Christina Aguilera's 'Beautiful' tribute to CNN Heroes". CNN. Time Warner. Retrieved April 26, 2013. ↑ Gil Kaufman (October 25, 2010). "Christina Aguilera Performs At Justin Timberlake Benefit Show". MTV News. Viacom. Retrieved April 26, 2013. ↑ Carly Wolkoff (November 2, 2012). "Christina Aguilera Brings 'Beautiful' Spirit To Hurricane Sandy Telethon". MTV News. Viacom. Retrieved April 26, 2013. ↑ "State House Vigil held in wake of Gay Suicides". The Rainbow Times. Archived from the original on December 24, 2013. Retrieved April 26, 2013. ↑ Michael Jensen (April 4, 2011). "Watch! "It Gets Better": Columbus Children's Choir and the Columbus Gay Men's Chorus". AfterElton. Retrieved April 26, 2013. 1 2 "Christina Aguilera voted most inspirational pop act for gay people". Stonewall. Retrieved April 26, 2013. ↑ "Christina". She Magazine. Retrieved April 26, 2013. ↑ Stephen Haag (January 28, 2004). "Clem Snide: A Beautiful EP". PopMatters. Retrieved May 5, 2013. ↑ "Kidz Bop, Vol. 4". Allmusic. Rovi Corporation. Retrieved April 26, 2013. ↑ "Kidz Bop, Vol. 6". Allmusic. Rovi Corporation. Retrieved April 26, 2013. ↑ "Kenny G: At Last... The Duets Album". iTunes Store (US). Apple Inc. May 19, 2003. Retrieved April 26, 2013. ↑ "Begin. by David Archuleta". iTunes Store (US). Apple Inc. August 7, 2012. Retrieved April 26, 2013. ↑ AllMusic (2005). "G4 & Friends". Allmusic. Rovi Corporation. Retrieved May 5, 2013. ↑ "Girl Authority Discography". Star Purse. Retrieved May 5, 2013. 1 2 "The Lemonheads: Vashons". Pitchfork Media. Retrieved May 5, 2013. ↑ "Zebrahead Discography". Official Zebrahead Website. Retrieved May 5, 2013. ↑ "The ReBeatles Project: Biography". Official The ReBeatles Project Website. 2010. Retrieved May 5, 2013. ↑ Gary Graff (June 29, 2012). "Insane Clown Posse's 'Mighty Death Pop' May Be Its Last Physical Album". Billboard. Prometheus Global Media. Retrieved May 5, 2013. ↑ "Me First and The Gimme Gimmes cover Christina Aguilera's 'Beautiful' - FasterLouder". FasterLouder. Retrieved 2016-04-03. ↑ "Something Beautiful - Jordan Smith | Songs, Reviews, Credits | AllMusic". AllMusic. Retrieved 2016-04-03. ↑ "Radio 1's Live Lounge, Vol. 3". Allmusic. Rovi Corporation. 2008. Retrieved May 5, 2013. ↑ "Ellen Catches Up with Savannah Robinson". Warner Bros. Television Distribution. October 11, 2011. Retrieved May 5, 2013. ↑ Jeff Benjamin (March 28, 2012). "Web Trends: Kelly Clarkson Covers Christina Aguilera". Billboard. Prometheus Global Media. Retrieved April 26, 2013. ↑ "Gloria Gaynor realizó espectacular concierto retro en Lima". Generaccion. December 4, 2010. Retrieved May 5, 2013. ↑ "Songs Covered by Jason Mraz". The Covers Project. Retrieved May 5, 2013. ↑ "Brett Anderson in Christina Aguilera Shock". NME. December 19, 2006. Retrieved May 5, 2013. ↑ "Alex Parks - Introduction". Review Stream. Retrieved April 26, 2013. ↑ "Angy Fernández". Etcétera. WordPress. January 28, 2011. Archived from the original on April 26, 2012. Retrieved April 26, 2013. ↑ Colin Vickery (November 16, 2010). "Victorian Sally Chatfield to test her X Factor in final". News Limited. Retrieved April 26, 2013. ↑ "Beautiful (The Voice Performance) - Single". iTunes Store (US). Apple Inc. June 28, 2011. Retrieved April 26, 2013. ↑ Gary Trust (July 7, 2011). "Who Won the Billboard Chart Battle: 'Idol' or 'The Voice'?". Billboard. Prometheus Global Media. Retrieved April 26, 2013. ↑ Keith Caulfield (July 6, 2011). "Beyonce Notches 4th Billboard 200 No. 1 with '4'". Billboard. Prometheus Global Media. Retrieved April 26, 2013. ↑ Lisa McGarry (October 1, 2011). "X Factor 2011 judges houses: Janet Devlin impresses with Christina Aguilera's 'Beautiful'". Unreality TV. Retrieved April 26, 2013. ↑ "The X Factor seventh live show round-up: Guilty Pleasures and Heroes". Metro. Associated Newspapers. November 26, 2011. Retrieved April 26, 2013. ↑ "A.N.T. Farm by Various Artists". iTunes Store (US). Apple Inc. October 11, 2011. Retrieved April 26, 2013. ↑ "Glee: The Music, Vol. 3 - Showstoppers (Deluxe Edition) by Glee Cast". iTunes Store (US). Apple Inc. May 18, 2010. Retrieved April 26, 2013. ↑ "House M.D. (Original Television Soundtrack) by Various Artists". iTunes Store (US). Apple Inc. September 18, 2007. Retrieved April 26, 2013. ↑ "The Music of SMASH (Soundtrack) by SMASH Cast". iTunes Store (US). Apple Inc. May 1, 2012. Retrieved April 26, 2013. ↑ Casey Cipriani (20 June 2014). "How the Closing Credit Songs in 'Orange is the New Black' Suit Each Episode". Indiewire. ↑ Beautiful (CD single liner notes). Christina Aguilera. Germany: RCA Records, a division of Sony Music Entertainment. 2003. ↑ "Australian-charts.com – Christina Aguilera – Beautiful". ARIA Top 50 Singles. Retrieved February 12, 2015. ↑ "Austriancharts.at – Christina Aguilera – Beautiful" (in German). Ö3 Austria Top 40. Retrieved February 12, 2015. ↑ "Ultratop.be – Christina Aguilera – Beautiful" (in Dutch). Ultratop 50. Retrieved February 12, 2015. ↑ "Ultratop.be – Christina Aguilera – Beautiful" (in French). Ultratop 50. Retrieved February 12, 2015. ↑ "Stripped – Charts & Awards – Billboard Singles". AllMusic. All Media Network. Retrieved June 15, 2007. ↑ "Danishcharts.com – Christina Aguilera – Beautiful". Tracklisten. Retrieved February 12, 2015. ↑ "Dutchcharts.nl – Christina Aguilera – Beautiful" (in Dutch). Single Top 100. Retrieved February 12, 2015. ↑ "Nederlandse Top 40 – Christina Aguilera search results" (in Dutch) Dutch Top 40. Retrieved February 12, 2015. ↑ "Hits of the World: Eurochart Hot 100 Singles". Billboard. Nielsen Business Media. 115 (12): 73. March 22, 2003. Retrieved April 17, 2016. ↑ "Lescharts.com – Christina Aguilera – Beautiful" (in French). Les classement single. Retrieved February 12, 2015. ↑ "Musicline.de – Christina Aguilera Single-Chartverfolgung" (in German). Media Control Charts. PhonoNet GmbH. Retrieved February 12, 2015. ↑ "Archívum – Slágerlisták – MAHASZ" (in Hungarian). Rádiós Top 40 játszási lista. Magyar Hanglemezkiadók Szövetsége. Retrieved February 12, 2015. ↑ "Chart Track: Week 10, 2003". Irish Singles Chart. Retrieved February 12, 2015. ↑ "Italiancharts.com – Christina Aguilera – Beautiful". Top Digital Download. Retrieved February 12, 2015. ↑ "Charts.org.nz – Christina Aguilera – Beautiful". Top 40 Singles. Retrieved February 12, 2015. ↑ "Norwegiancharts.com – Christina Aguilera – Beautiful". VG-lista. Retrieved February 12, 2015. ↑ "Arhiva romanian top 100 – Editia 15, saptamina 21.04-27.04, 2003". Romanian Top 100. Archived from the original on May 14, 2005. ↑ "Swedishcharts.com – Christina Aguilera – Beautiful". Singles Top 100. Retrieved February 12, 2015. ↑ "Swisscharts.com – Christina Aguilera – Beautiful". Swiss Singles Chart. Retrieved February 12, 2015. ↑ "Archive Chart: 2003-03-08" UK Singles Chart. Retrieved February 12, 2015. ↑ "Christina Aguilera – Chart history" Billboard Hot 100 for Christina Aguilera. Retrieved February 12, 2015. ↑ "Christina Aguilera – Chart history" Billboard Adult Contemporary for Christina Aguilera. Retrieved February 12, 2015. ↑ "Christina Aguilera – Chart history" Billboard Adult Pop Songs for Christina Aguilera. Retrieved July 11, 2015. ↑ "Christina Aguilera – Chart history" Billboard Hot Dance Club Songs for Christina Aguilera. Retrieved February 12, 2015. ↑ "Christina Aguilera – Chart history" Billboard Latin Pop Songs for Christina Aguilera. Retrieved July 11, 2015. ↑ "Christina Aguilera – Chart history" Billboard Pop Songs for Christina Aguilera. Retrieved February 12, 2015. ↑ "Christina Aguilera – Chart history" Billboard Rhythmic Songs for Christina Aguilera. Retrieved February 12, 2015. ↑ "ARIA Charts – End of Year Charts – Top 100 Singles 2003". Australian Recording Industry Association. Archived from the original on January 23, 2012. Retrieved April 26, 2013. ↑ "Jahreshitparade 2003". Ö3 Austria Top 40. Retrieved April 26, 2013. ↑ "Archived copy". Archived from the original on 2010-09-14. Retrieved 2011-02-16. ↑ "Archived copy". Archived from the original on 2008-04-17. Retrieved 2011-02-16. ↑ "Offizielle Deutsche Charts" (in German). Media Control Charts. Retrieved April 20, 2016. ↑ "Irish Charts – Best of 2003". Irish Singles Chart. Retrieved April 26, 2013. ↑ "Top Selling Singles of 2003". Recorded Music NZ. Retrieved April 26, 2013. ↑ "Arslista Singlar – Ar 2003" (in Northern Sami). Grammofon Leverantörernas Förening. Archived from the original on April 2, 2015. Retrieved April 26, 2013. ↑ "Swiss Year-End Charts 2003". Schweizer Hitparade. Retrieved April 26, 2013. ↑ "Yearly Best Selling Singles" (PDF). British Phonographic Industry. Archived from the original (PDF) on January 17, 2013. Retrieved April 26, 2013. ↑ "Hot 100 Singles & Tracks". Billboard. Nielsen Business Media. 115 (52): YE-30. December 27, 2003. Retrieved April 20, 2016. ↑ Taylor, Chuck (December 27, 2003). "Adult Contemporary". Billboard. Nielsen Business Media. 115 (52): YE-82. Retrieved April 20, 2016. ↑ "Beautiful [Vinyl]". Amazon.com. Retrieved February 12, 2015.